We donate our Smile Bags to ward playrooms and the Play Specialists pass them onto to children when they need distracting, to fill some of the many hours spent on the ward or to cheer them up when having a bad day. These bags are filled with activity books, colouring, stickers, crafts and other fun things. The children can enter our Smiley Face Competition and send a Smile to a friend. All in a little cotton re-useable bag. Feed back tells us that the children enjoy what's inside. 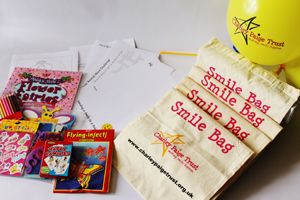 Children who receive one of our Smile Bags can enter our Smiley Face Competition for free. They just design a smiley face which can be anything they like. Then pop it in the post and we pick a winner each month. The winner receives a £10 Argos voucher, a certificate and more stickers. Winning designs are displayed here. Press the button to view them. Have a go at drawing a smiley face on any device. Select what you are using below to start creating your art work.